Property Details: 1 Bedroom, 1.5 Bath beachfront home with more than 1000 square feet. 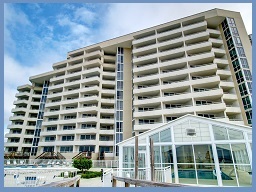 Perdido Key Real Estate Sales, Perdido Sun condominium home.Top floor, Penthouse 1 bedroom / 1.5 Bath gulf front unit with one of the best views in the entire building. Unit has not been rented since 2004 and is in immaculate condition. Patio furniture is upgraded, with brand new windows along with total black out curtains. Kitchen has a water purification system. Perdido Sun offers great amenities including beautiful lobby area, fitness room, spacious outdoor pool and hot tub, glass enclosed indoor pool, bbq area and is walking distance to several restaurants located in the Villago Town Center just across the street.Come see this resort home at Perdido Sun Condos in Perdido Key FL.